In his post-synodal apostolic exhortation Pastores Gregis (“On the Bishop, Servant of the Gospel of Jesus Christ for the Hope of the World,” Oct. 16, 2003), Pope John Paul II underlines the scriptural boldness demanded of the bishop as shepherd (No. 66c). In this context, he describes the bishop as a “prophet of justice,” declaring: “He proclaims the church’s moral teaching by defending life from conception to its natural end” (No. 67a-b). In proclaiming the church’s moral teaching, the bishop faces a challenge before the situation of a member of the flock who is engaged in political life and supports a position contrary to the moral law. The situation is especially serious when the position in question is contrary to the first precept of the natural and divinely revealed moral law, which requires us to safeguard and foster human life. It is made even more serious when the position espoused condones the taking of the innocent and defenseless life of the unborn child, a crime which “has characteristics making it particularly serious and deplorable” (John Paul II, Evangelium Vitae, “On the Value and Inviolability of Human Life,” 1995, No. 58a). The Catholic bishops of the United States, at their meeting in November 1998, approved Living the Gospel of Life: A Challenge to American Catholics, a statement that constitutes a collective exercise of the episcopal responsibility to shepherd by speaking for justice. We declared: “No public official, especially one claiming to be a faithful and serious Catholic, can responsibly advocate for or actively support direct attacks on innocent human life” (No. 32). We acknowledged that the greatest good that a Catholic politician, “whose absolute personal opposition to procured abortion” is “well known,” may be able to accomplish, at a given time, is to limit the harm done by a “law which allows or promotes a moral evil.” At the same time, we made it clear that “no appeal to policy, procedure, majority will or pluralism ever excuses a public official from defending life to the greatest extent possible” (No. 32; see Evangelium Vitae, Nos. 73-4). On Nov. 24, 2002, the Solemnity of Christ the King, the Congregation for the Doctrine of the Faith, with the approval of Pope John Paul II and by his order, published a Doctrinal Note on Some Questions Regarding the Participation of Catholics in Political Life for the purpose of recalling “some principles proper to the Christian conscience, which inspire the social and political involvement of Catholics in democratic societies” (No. 1d). The note states the constant teaching of the church “that those who are directly involved in lawmaking bodies have a ‘grave and clear obligation to oppose’ any law that attacks human life” (No. 4a). It further makes clear that “the rightful autonomy of the political or civil sphere from that of religion and the church” cannot mean an autonomy of the political order from morality, and that for the Catholic involved in political life, serving the common good certainly means “acting in conformity with one’s own conscience” (No. 6c). In this regard, the doctrinal note observes that it is “a form of intolerant secularism” that disqualifies Christians from political life because of their duty to act according to their conscience (No. 6d). It is understood that a correctly formed conscience cannot be “set in opposition to the moral law or the magisterium of the church” (Catechism of the Catholic Church, No. 2039; see also No. 1783). It is the bishop’s duty to give pastoral care to Catholic politicians who offer a most important service to the whole of society. The bishop’s pastoral care in no way constitutes an unjust involvement of the church in politics. The bishop leaves to Catholic politicians and all politicians the practical decisions about the best way to serve the common good. A politician’s practical decision regarding how to safeguard the common good necessarily includes protecting the life of every individual. The failure to protect the life of the unborn, a violation of the moral law, violates the common good and betrays the trust given to elected officials. The bishop’s pastoral concern is for the spiritual good of the Catholic politician and of the many Catholics who are influenced by his or her exercise of political leadership. More fundamentally, the bishop’s concern is for the good of the innocent human lives threatened and taken by procured abortion. The “intolerant secularism,” which tells a Catholic politician that he may not act according to his conscience, characterizes the exercise of the bishop’s pastoral responsibility as a violation of the legitimate autonomy of the political sphere from the church. Right reason, on the contrary, tells us that a bishop, if he truly cares for the flock, must admonish Catholic politicians “who choose to depart from church teaching on the inviolability of human life in their public life” regarding “the consequences for their own spiritual well being, as well as the scandal they risk by leading others into serious sin” (Living the Gospel of Life, No. 32). Once again, it must be noted that the bishop always has before his eyes the most fundamental good of life from the moment of conception. The danger of scandal is real. In Evangelium Vitae, Pope John Paul II describes in a compelling way how the moral gravity of abortion “has become progressively obscured” in our time (No. 58b). It was brought home to me recently when a highly placed government official who is not Catholic, reflecting upon the great number of Catholic politicians who vote for laws that provide for abortion and the seeming acceptability of such a position in the church, asked me sincerely, “Is it possible, Archbishop, that a different pope would change the church’s teaching on abortion?” As a bishop, I cannot be naïve about the fact that the church’s clear and consistent teaching and discipline regarding procured abortion over nearly 2,000 years is, in our time, badly obscured in the minds of many, including Catholics. The bishop’s call to be “a prophet for justice” on behalf of the innocent and defenseless unborn is clarion clear. Canon 915 of the Code of Canon Law requires that those who “obstinately” persevere “in manifest grave sin are not to be admitted to holy Communion.” Some have wrongly characterized my application of this norm in the case of Catholic politicians who support anti-life legislation as the imposition of a canonical sanction. First of all, Canon 915 is not part of Book Six of the code, which treats of ecclesiastical sanctions. It is true that ecclesiastical sanctions may involve exclusion from the reception of holy Communion, even as the first part of Canon 915 notes, referring to those “who have been excommunicated or interdicted.” But the second part of the canon refers to an exclusion that is inherent in the nature itself of the sacrament of the holy Eucharist. The Eucharist, our greatest good in the church, is “the culmination of all the sacraments in perfecting our communion with God the Father by identification with his only-begotten Son through the working of the Holy Spirit” (John Paul II, encyclical letter Ecclesia de Eucharistia, “On the Eucharist in Its Relationship to the Church” (April 17, 2003, No. 34b). The reception of Communion, therefore, requires certain dispositions within us, lest we sin against the holiness of the sacrament. In his encyclical letter Ecclesia de Eucharistia, Pope John Paul II presents, in a full way, the visible and invisible dimension of the communion with Christ and the church that must exist for a worthy reception of the body of Christ (Nos. 34-46). Regarding the invisible dimension of communion, he reminds us of what we have been taught or should have been taught from our first preparation for holy Communion, namely that it is a sacrilege to receive the sacrament when one is not in the state of grace. One who publicly condones and promotes objectively grave sin also lacks the proper disposition for the worthy reception of holy Communion. As the Catechism of the Catholic Church, following the ancient admonition of St. Paul, reminds us, we must examine our conscience before approaching to receive Communion; and if we are involved in a grave sin, we must repent and be absolved of the sin in the sacrament of penance before receiving Communion (No. 1385 and 1 Cor 11:27-29). I write this as one who must and does examine his own conscience every time he celebrates Mass and receives Communion, as one who is only too well aware of his own need of constant conversion. The matter is complicated further by the public nature of the Catholic politician’s violation of the moral law in supporting or voting for legislation that permits the taking of an innocent human life, for the sin risks scandal to others. The scandal is especially grave when Catholic politicians not only fail to restrict the evil of abortion within the bounds permitted by the U.S. Supreme Court, but even promote the “right” to abortion, praising the historical extension of this right and harshly criticizing those who favor laws to protect unborn human life. How can one not be gravely scandalized by the spectacle of Catholic politicians who advance the agenda of pro-abortion organizations like Planned Parenthood and the National Abortion Rights Action League? In other words, for the Catholic politician to receive Communion when he or she has publicly violated the moral law in a grave matter like procured abortion risks leading others into thinking that they can accept procured abortion with a right conscience. In such a case, if the Catholic politician does not recognize the lack of the proper disposition to receive Communion, then the church herself must refuse the sacrament, in order to safeguard the worthy reception of the sacrament and to prevent a serious scandal among the faithful. I mentioned above the conversation with a prominent non-Catholic public official who was confused about the firmness of the church’s teaching on procured abortion because of Catholic politicians who support pro-abortion legislation and yet claim to be good Catholics. After I had set forth the church’s discipline in the matter during my service as bishop of La Crosse, many Catholics and non-Catholics alike wrote to thank me for making clear what had been very confusing for them. The teaching and discipline that I set forth is not in any way new, and it should not be exploited as a political tool by anyone. Did I impose a canonical sanction on the Catholic politicians from the Diocese of La Crosse, who had departed from the church’s teaching on the inviolability of human life? I did not. I merely declared that public cooperation in a gravely sinful act, which has always excluded one from the worthy reception of the sacrament and is the cause of scandal, was present in the situation I was addressing. Here I note that the declaration regarding the exclusion from holy Communion came only after a personal communication of the church’s teaching and the request to speak with the Catholic politicians about the gravity of their position. Canon 915 does not require that the competent authority in the church actually judge the state of a person’s soul, which only God can do, but rather the objective contradiction between the faith the person professes and his or her persistent actions contrary to clear teaching, after pastoral admonition, especially in the light of the harm that such counter-witness causes. In this regard, it seems to me that there has been a general failure in the church to teach effectively the truth about the holy Eucharist and what is required to approach the sacrament worthily. I have frequently had the impression that some Catholics today believe that mere presence at Mass means that one may receive Communion. Reception of Communion can become a kind of social action of those present at Mass. In such a climate, to state that anyone is excluded from Communion is seen as the imposition of a harsh sanction, when, in fact, it is merely the recognition that one is involved in objectively grave sin. Finally, some have questioned whether a Catholic politician’s public departure from the church’s teaching on the inviolability of human life constitutes manifest grave sin. Certainly procuring an abortion is “a gravely sinful act.” Supporting legislation that provides for procured abortion is participation in a gravely sinful act, what the church’s moral teaching calls formal cooperation. The natural and divinely revealed moral law forbids this cooperation in the taking of an innocent life (Evangelium Vitae, No. 73b). Therefore a Catholic politician who supports or votes for laws that are unjust, because they permit procured abortion, persists in a gravely sinful act. Some have accused me and other bishops of introducing division within the church and between the church and the political order of our country by our public declaration regarding the moral duty of Catholic politicians and their exclusion from Communion, in the case of their serious failure in carrying out their moral duty. Others have questioned the prudence of such declarations because of the attack they bring upon the church or their adverse political effect. I have often reflected upon these accusations, in examining my conscience regarding my action in the matter. Having considered the matter carefully, I respond that the division is already present, both in the conscience of Catholics who dissent from a most fundamental church teaching and in the “intolerant secularism” prevalent in our nation, which would exclude Catholics from political life unless they be willing to violate their conscience. In our habit of “political correctness,” we do not like to acknowledge these divisions, but they must be recognized for the sake of our consciences and for the good of the nation. For a bishop or any pastor to exclude someone from Communion is always a source of great sorrow. The sorrow is caused by the care that a pastor naturally has for a soul who rejects the teaching of Christ and his church. What would be profoundly more sorrowful would be the failure of a bishop to call a soul to conversion, the failure to protect the flock from scandal and the failure to safeguard the worthy reception of Communion. Because abortion is a grave sin, it is difficult to argue against Archbishop Raymond L. Burke's compelling defense of his refusing communion to politicians who support abortion. It is hoped that Burke's concern for the sanctity of life extends to those who escaped the horror of abortion and were allowed to be born. The next logical step would be for Burke to refuse communion to those politicians who support war and the death penalty and oppose legislation that helps lift children out of poverty. We must have a consistent ethic of life. War, capital punishment, and abortion are all part of the culture of death. A major step in condemning war would be for Burke and all bishops to forbid priests from serving as military chaplains. One of the most sacrilegious acts seen during war is a chaplain giving communion to soldiers who then go out kill, an action equally as evil as abortion. God's commandment is "thou shall not kill." He did not attach any amendments or exceptions to his commandment. And do not forget that Jesus demanded, "Love your enemies." It is impossible to both love and kill them. Not only should priests be forbidden to serve as military chaplains, but all Catholics should be forbidden to serve in the military. This is an issue just as important as stopping abortion. When Archbishop Burke said the Church's position on abortion was unchanged for almost 2000 years, I wonder if he was correct? St. Augustine stated early abortion required penance only for sexual sin. St. Thomas Aquinas said abortion was not homicide unless the fetus was ensouled. The 1140 Canon law said abortion was only homicide if the fetus is formed as a human being. Pope Grtegory XIV softened the decree of Sixtus V to say that where no homicide or animated fetus is involved the punishment should not exceed that allowed by canon on civil law. Delayed hominization had been the rule ubtil Pius IX called all abortion homicide. For what it's worth, the Muslims consider ensoulment to occur four months after the conception process, the Anglicans two weeks and the Jews at birth, Since the possibility of twinning is gone by two weeks, do you suppose the Anglicans have it right? Archbishop Raymond L. Burke in his “Prophecy for Justice” set forth his thesis that in certain cases Catholic politicians may not recognize their lack of proper disposition to receive the Eucharist, therefore it is the Church’s responsibility to bar them from the sacrament in an effort to “safeguard the worthy reception of the sacrament and to prevent a serious scandal among the faithful.” The Archbishop goes on, in his reflection on pastoral care, by stating that if a bishop “truly cares for the flock,” he must admonish the Catholic politicians in question. However, the fact remains that there are many bishops in this country, probably the majority, who do not think barring politicians from receiving Holy Communion is the best way to handle this issue. As Cardinal Theodore McCarrick of Washington, DC said over a month ago, “I disagree that in this instance we should use denial of the Eucharist as a public sanction. As a priest and bishop, I do not favor a confrontation at the altar rail with the Sacred Body of the Lord Jesus in my hand. There are apparently those who would welcome such a conflict, for good reasons, I am sure, or for political ones, but I would not.” Archbishop Burke may not like to use the term “sanction” to describe his directive, but this declaration of exclusion is just as much of an infectious subrosa polemic into the body of the Church. I think the most important question to be addressed in this “sanctions vs. no sanctions” or “declaration of exclusion vs. no declaration of exclusion” debate is that of the conscience. While his concerns of unworthy reception are well intentioned, Archbishop Burke should take care not to flout what the Second Vatican Council stated on the conscience in its document on religious liberty. To articulate an exclusion of a targeted group of Catholic politicians would be against the spirit of that document, which so clearly states the importance of the individual person in examining his “secret core” and “sanctuary,” where he is “alone with God.” While the most recent report of the United States Conference of Catholic Bishops ("Catholics in Political Life") leaves the decision to exclude in the hands of the individual bishops, it would appear that the Vatican is not looking favorably upon sanctions or the like. 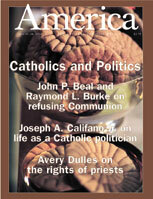 The article by Archbishop Raymond L. Burke entitled "Prophecy for Justice" (June 21, 2004) is elegantly written, clear and strong in its logic and theology, and stiff and judgmental in its conclusion: that Holy Communion must be used as a political weapon in this election year on the American scene. Another article in the same issue, "Holy Communion and Unholy Politics." by John P. Beal, is somewhat plainer in expression, equally clear in logic, perhaps softer in theology, but surely superior in its grasp of Christian charity. I hope that Bishop Burke can take a lesson from John Beal’s better understanding of the American scene, let alone canon law. When Archbishop Burke (America 6/21) quotes Pope John Paul II’s demand of bishops to proclaim “the church’s moral teaching by defending life from conception to natural death,” he calls to mind the late Cardinal Bernardin’s “seamless garment of life.” Yet, in his systematic treatise on the role of Catholic politicians, the archbishop made that garment a bit wide in the hips. He never—not once—calls politicians to accountability in protecting any other stage of life besides that of the unborn. It is true that the right to birth is fundamental, but are Catholic bishops speaking anything nearly this impassioned about the quality of life these newborns are born into? Every word, every action of Christ was directed toward compassion for all God’s people. If the archbishop is so “clarion clear” about the church’s “consistent teaching and discipline regarding procured abortion over nearly 2,000 years,” why isn’t he “clarion clear” about defending all of life? In “Prophecy for Justice,” my own archbishop, Raymond Burke, defends himself saying he is not using Canon 915 “as the imposition of a canonical sanction.” But he and Bishop Michael Sheridan of Colorado Springs, among others, not only would deny the Eucharist to certain politicians who “obstinately” persist “in manifest grave sin”; they also advocate withholding the sacrament from those who vote for such politicians. As a Catholic who regards the Eucharist as the ultimate gift of life, I wonder why our bishops cannot look to Jesus for guidance. At the Last Supper, Judas had already made betrayal arrangements, and Jesus knew it. After supper, Jesus announced that Peter would cause scandal by publicly denying him. Yet Jesus, the “highest” priest, did not withhold that first Eucharist from either of those public sinners. I hope our bishops take note. This article also appeared in print, under the headline "Prophecy for Justice," in the June 21, 2004 issue. Most Rev. Raymond L. Burke is the archbishop of St. Louis, Mo.